With as many different types of people as there are in the world, you'd better believe there are just as many office chairs. 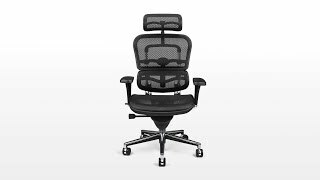 If you prefer one without a headrest but still has all of the features of a high-end ergonomic desk chair, the Raynor Ergohuman Chair - Mesh Chair model ME8ERGLO is breathable to the max for all types of working conditions yet oozes style in chrome and polished aluminum. Don't settle for anything less than ergonomically advanced seating that suits you ideally. The single-paddle mechanism allows you to take advantage of the Ergohuman Chair's countless adjustments through the manipulation of just a single lever. It's simple seating made optimally comfortable for you, how you like it. The ME8ERGLO Raynor Ergohuman is available in six mesh colors: black, plum red, orange, green, blue, or gray. The colored mesh choices feature interwoven black mesh. Ordering had a few hiccups with the new website but the issues were pleasantly worked out with Sami Jo. The chair is now received, assembled and Exec started using today. So far so good! This is my second erghohuman chair. I bought the first on, the me7-erg (the headrest version of this chair) about 4 years ago. I'm a film and video editor so I sit in front of computers all day. The first chair has been one of the best purchases I've ever made. I bought this new one because I needed a decent chair for a job away from my usual office. I could have bought anything I wanted. I didn't hesitate to buy this one. I like Aerons, but unquestionably the ergohuman's are superior chairs. Also, Humansolution is a great company from which to order. In L.A., I had the chair delivered within one day!!! Chair is very comfortable. Only complaint is that when the arms are all the way down, they are still too high. I am 5'11" and sitting straight up, my arms are two high. That is not ergonomically correct. Do you possibly have shorter arms we can exchange? The chair had a wobble where the gas cylinder meets the chair seat and would make a loud clunking noise often. This is something I associate with much less expensive chairs. The fabric was very rough as well, catching clothing. The lumbar support protrudes too far for me and is spring-loaded but not really adjustable in the sense of moving it away. Truth is, I didn't think the chair was worth the money. I sought out a Haworth Zody chair and have been pretty impressed with it after two weeks. $685.00 List Price: $1,282.00* The list price is the same as the MSRP (Manufacturer's Suggested Retail Price). It may not necessarily be the price at which the product is sold.